A friend of mine told me yesterday that even though he pays his wife compliments every day, she is like a dry sponge. She absorbs the sweet words and takes them to heart. Every time. It's never one time too many. He's good at that. And she needs to hear it. We all need to hear good words now and then. Some of us require it--need it--long for it--often. Others are alright with the occasional compliment. They still function. I love compliments. I admit it. It makes me feel good and boosts my self-esteem. It makes me want to perform even better. It helps me reach heights and grab opportunities. Women are especially sensitive to this. We often tell ourselves we lack ability and are not up to par with what everyday life requires. Where were we in line when self-confidence was handed out? I believe men were further up front. They don't seem to worry as much as women do. So here is when a compliment or five come in handy. It's amazing what that will do to someone who needs to hear that they are OK. Telling yourself you are wonderful can work, too, but to hear someone else say in all honesty that you are special is uplifting and builds both self-esteem and a positive attitude. Can we be a people who aim to buoy up those around us by finding positive things to tell them? Can we find good traits in every person instead of searching out faults and negative issues? It's possible to train ourselves to speak well of others. What will come of it? Let me put it this way: "Happiness is like jam. You cannot spread it without spilling some on yourself." In other words, making someone happy will eventually be to your own benefit. An investment which will make you feel good. 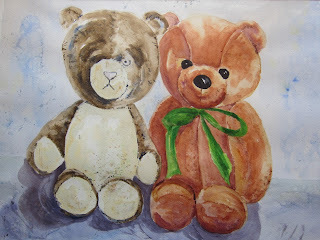 Today's water color is called "The old and new teddy bear".